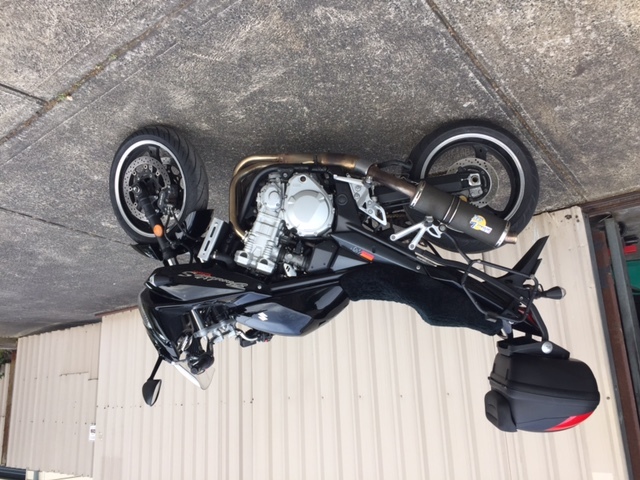 while reading the posts on this site i thought what the hell the bike needs a service anyway ,so i asked my 2 mates to give me a hand to service both bikes 1250 07-2015 bandit and my Harley .we first started on the Harley and finished it quite quickly so the looked at some of the posts on air box mods and the second butterfly's removal.we decided to take the throttle cables out of the twist grip and take the hole Assembly off and on the bench .just as well as the tip broke on 2 screw drivers ,and yes we heated up the screws .once this was done and the bike back together i went for a ride then my 2 mates went for a run .what a difference these changes made .i have now done some mods to the std exhaust can by taking the back plate off to find out only 3 of the Alan keys hold the plate on .the next part is then wielded together,so out came the drill .a 16mm and a 10mm .16 around the outside and 10 in the small middle section .then in the plate 16mm in the wholes the Alan keys were in.the bike is only slightly more noise but less induction noise .to me this means that it's not fighting to get rid to the exhaust gas .once this was done i reset the tps as it was idling 200 odd rpm higher .with these cheep mods done the bike is so easy to ride at low speed around town ,plus the h/way just feels easy to past a car if needed .WHY DID I NOT CHANGE THE PIPE ???? .all of the cans i have looks at are quite loud ,with the idea of keeping the bike as std looking and sounding as possible ,along with the year of the bike most supplier's wouldn't tell me 100% there pipe would fit . (too new 7/15 i have to order 2016 parts to make Shaw they fit . buy the way the k/n air cleaner that was fitting to the bike at my request on the first service is great till 5000 odd rpm then it starts leaning out 140 kg i am with all the safety gear on 1/4 mile with me on it 12.40 best time after 3 meets (12.40 to 12.55 most consist-ant 104 to 105 mph ) .these modes 11.01 already 117 mph so !!!!!!!!!! yes std the bike runs 11.1 to 11.0 thats with a 60kg rider not my weight people .hope this will helps someone out . Welcome to the forum Brad ......... where do you live ?. @paul wrote: Welcome to the forum Brad ......... where do you live ?. hello there in Brisbane city Paul .with all the Queensland laws ,plus being pulled out over quite often on the Harley is most of the reason of trying to keep the bike as std looking and sounding as possible .with the holes drilled smaller than they are now it was what you would call farting out of the tail pipe .with the k/n air cleaner in the felt like and the 1/4 mile backed it up it was running lean .the mods and the pipe now just so much easier to ride .email me about anything i have done when ever you want Paul . I didn't get this the first time I read it but 10 hrs later I read it again and I got it - Good One Chook! Ps: A Sunny Nth Qld welcome to you Brad Dolby! Welcome to the Forum Brad. @madmax wrote: Welcome to the Forum Brad.